Fire science technology instructors at Lone Star College-Montgomery train in the college's newly acquired class A flashover chamber. knows that more than the instructors of the fire science technology program at Lone Star College-Montgomery. After months of discussion about how beneficial it would be for the program to have a flashover chamber easily accessible for training purposes, it has become a reality. 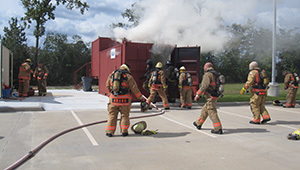 The newly acquired flashover chamber was added to the college’s already existing, state-of-the-art training facility at The Woodlands Emergency Training Center, shared through a partnership between The Woodlands Fire Department and LSC-Montgomery. A flashover, the near simultaneous ignition of a room or enclosed area into flames, can be recreated in this controlled environment, offering a real-life burn experience similar to what cadets will encounter in the field. This simulation allows instructors the ability to conduct advance training on fire dynamics, offer a unique observation standpoint that allows cadets to better see developing conditions, and increase firefighter awareness. Griffin explains that a controlled fire is ignited in the firebox and cadets will be in the observation area of the chamber, below the firebox. They will be able to see the fire from its beginning stages, all the way through to a fully developed fire. Because no one fire is the same, he said, cadets will be able to read various situations and determine the best course of action for fighting that particular fire. The fire science technology program at LSC-Montgomery began in spring of 2009, and the associate degree in fire science technology was approved in spring of 2010. The nine-month fire academy is approved by the Texas Commission on Fire Protection and, over the last two years, has achieved 100% pass rate on the Texas Commission on Fire Protection state written exam. The program offers day and night classes, and cadets that have graduated from the LSC-Montgomery program have been hired by fire departments such as Houston, Conroe, The Woodlands, Montgomery, Spring, Beaumont and Willis. The fire science technology program at LSC-Montgomery also offers community outreach by assisting local fire departments with continuing education, training in fire service, disciplines and certifications through the Texas Commission on Fire Protection, in courses such as driver operator, fire officer and fire instructor. Griffin has plans to continue growth of the program, with the goal to expand the flashover chamber. The newly acquired piece of equipment is just phase one, he said, and he hopes to attain other phases and props, to complete the class A burn simulator, which burns ordinary combustibles such as wood, paper and trash, in addition to the programs already existing class B building, which burns gas. For more information about the fire science program at LSC-Montgomery, visit www.LoneStar.edu/fire-science-dept-montgomery; or contact David Griffin at David.K.Griffin@lonestar.edu.